better you update the poll OP. Fearless V and valeren like this. What are you exactly rating here? Because sorc and tamer can regularly be in top ten and win most fights if you know how to play these classes. Just overall how good they seem. You said yourself that tamer needs a lot of skills to be efficient and part of SA is being able to survive with few skills. When you have classes that can CC you once and kill you with sub 250 AP (*cough* musa *cough*) you need to be able to win an encounter with as few CCs as possible, and be as hard to CC yourself as possible, to ensure your survival. Running can sometimes work but often that means you get 1 tapped later down the road as you hide in a corner with 400 gear score and 200 HP. So I checked our rankings. Tamer was ranked 1 since Shadow arena started however this was only 1 tamer and considering Musa is the latest addition you can easily see how Musa has climb the rankings. The Tamer was at no1 on Friday with the same amount of wins where the Musa was under 80 so that Musa probably played and won all weekend. 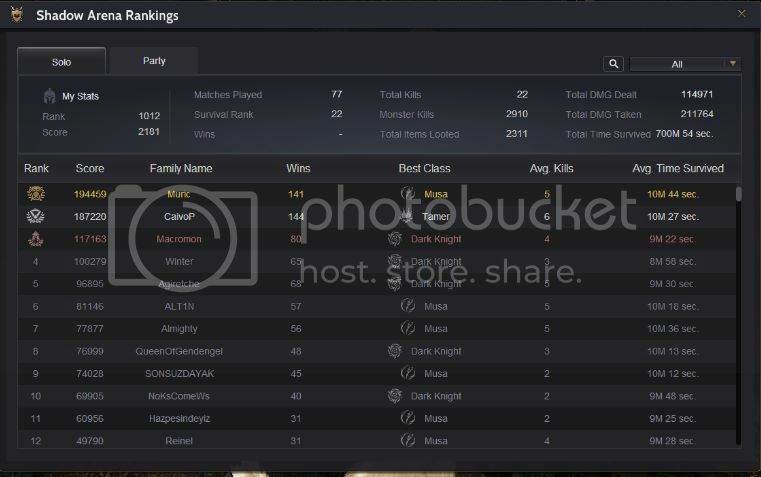 Top tier is Musa and DK on our servers for solo. For team obviously wizard/witch makes a huge difference. Still this show that Tamer could be great in solo if played well but I guess if you get good rng with any class they could win. Nah man, mystic is overpowered in shadow arena, they need to get nerf like musa. Nope, they just have a bound and down attacks right from the start, it helps a lot when it comes to getting a good start (but some other classes have it too) and later, they're quite tanky and quick, but without excessive damages. All in all, it is not OP, but their oponents often don't know how to deal with them. Sorc's changes were extremely effective at making that class so much better. The Musa nerfs were significant, but their kit remains pretty good. The Dk was nerfed accordingly. They should keep it without the air strike honestly. Tamer auto-attack nerf did hurt Tamer's snowball potential. Witch and Wizard's did not need Sage's Memory. Mystic starting kit was also buffed, which gives them snowball potential. I think the tier list, if I was to make one would have to consider the consistancy in games. The more consistant finalists that are threatening are generally Warriors, Witchards, Valkyrie, Musa. However, putting them in Meta tier for the sake of it does not give justice to some other very threatening late-game finalists that are probably even more dangerous wildcards like: Sorceress and Tamer. Out of those two, Sorceress is creeping up into the meta tier. The worst class is probably Mystic, but she'd be instantly top tier had she have her grab. However, her damage seems much better now due to the recent damage buffs. On the averages, we have Dark Knight, Giant, Kunoichi. Dark Knight is the most consistant out of those 2 others. However, all classes can definitively win. I can say Mystic is the worst class out there, but she certainly can deal with other non-grab classes. In NA, you have to scroll down up to rank 44 to find the first Mystic player in the ranking. Yes, Mystic is better since the buff... But before, she was just fell flat most of the time. So how do you guys find the new classes?